22 Even in anticipation to write this post I found myself rushing, doing two things at once, and inhabiting a mental space that was focused on the future rather than the present. In some ways I can welcome and appreciate my can-do, hard working attitude, but in another respect I need to coach myself to SLOW DOWN. This can sound like the most annoying advice when you are on a deadline, in the midst of a task, or feeling “behind” in some kind of way. 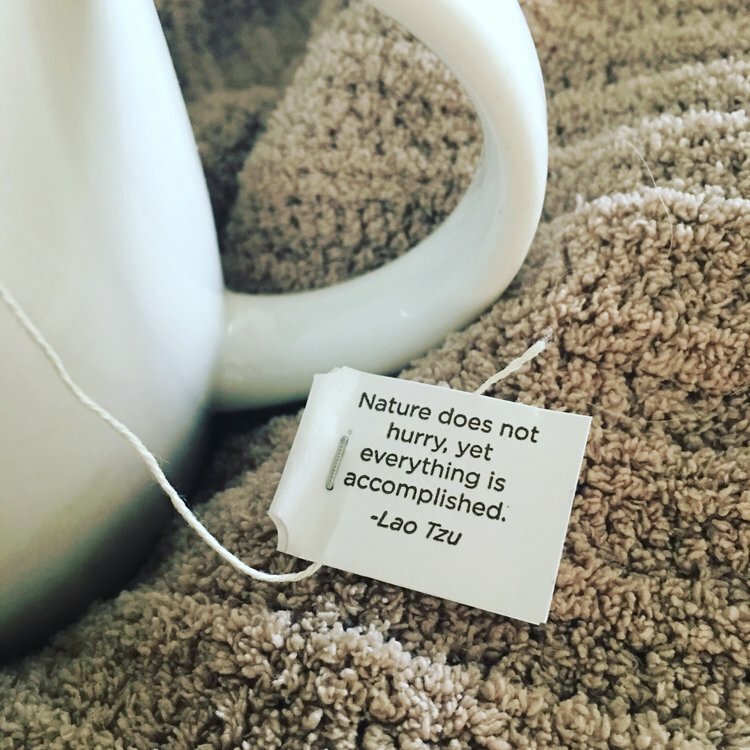 But in this post I want to break down the art of slowing down so that not only does it sound like a good idea, but it is also possible. First, take a moment to think back on all your best ideas. What you might find is that all your revilations came at a time when you were relaxed and centered. Examples of this are when you are on vacation, on a run, in the shower, talking to a loved one, drinking your Sunday morning coffee, etc. For the most part these are all times when we take the time to be in the moment, chill, and are not forcing ourselves to “solve” something. Now that we are convinced that relaxing is a good idea and CAN help us move forward, HOW can we do it? Meditating is the simple answer. But for some this can heighten anxiety and/or seem like a waste of time, especially if it is not already a part of your daily life. In an effort to make this concept more approachable, I will outline simple mindfulness practices that can take as little as 1 minute and require no prior mindfulness experience. Option 1: Sit in a comfortable position and see if you can hear all the sounds around you. Notice the humming of the fan, notice the traffic outside your office or home, notice any music playing or voices from the tv, and then lastly see if you can listen to the sound of your own breath. Thats it, just a simple way to reconnect you with this exact moment in time. Option 2: On your next inhale recite the word “LET”. On the exhale recite the word “GO”. You can say these words softly out loud, or the way I prefer is to say them inside my head. This is a great practice to use when driving, in a boring office meeting, or when you are having trouble falling asleep. Not only do these exercises make us feel good almost immediately, but they also have a positive and powerful affect on our outlook, productivity, and happiness well into the future.